Being overweight or obese is a risk factor for conditions like hypertension and diabetes. How do you know you’re overweight or obese? There’s what is called BMI (body mass index) used to determine that. BMI divides your weight in kg with the square of your height in metres (m^2). So if you have a scale and standard measuring rule at home, weigh yourself and record it, then measure your height and record it. BMI is weight/height^2. The normal BMI is between 18 to 24.9kg/m^2. BMI above 25 is overweight and the higher it is, the higher the risk of having hypertension. For those with hypertension the aim is to maintain your weight within a BMI of 18 to 24. This means watching what you eat. Take a lot of fruits and vegetables and low-fat milk, cut down the amount of garri or fufu you swallow per day, cook with plant-based cooking oil (vegetable or groundnut oil), and eat lean meat more. Doctors recommend that you engage in at least 30 minutes of aerobic exercise 3 to 5 times a week. This means you can run on a treadmill or cycle on a stationary or moving bicycle, or do some long distance jogging for at least 30 minutes. Your doctor will recommend the appropriate exercise after fully evaluating you. Stopping smoking and reducing alcohol intake. Smoking is really bad for your health and has been implicated in many types of cancer. It has also been implicated in hypertension. If you smoke, the healthy thing is to stop whether or not you have hypertension. It may be difficult to stop smoking, especially if one has become addicted or dependent on it, and this is where it is advisable to see a substance abuse expert (doctors who specialised in the branch of medicine called psychiatry) who will help such a person to gradually do away with smoking. In addition, it is important to significantly reduce the quantity of alcohol intake, or totally stop its intake if one has been diagnosed with hypertension. For men, the amount of alcohol taken per day should not be more than 30mL and for women it shouldn’t be more than 15mL. On the other hand, the amount of potassium taken per day should be increased. This is achieved by taking food rich in potassium such as banana, sweet potato and white beans. 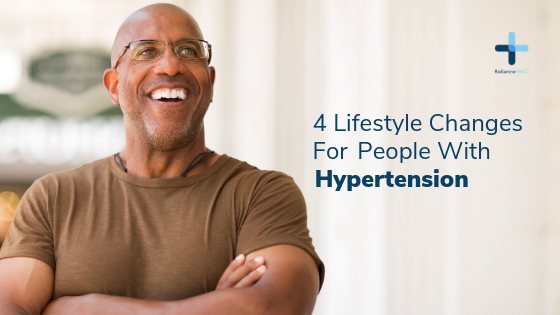 These lifestyle changes help to significantly lower blood pressure, thereby reducing the risk of developing complications of hypertension such as stroke. For this to be successful, anyone with hypertension must be faithful in sticking to all recommendations above as given by their doctor.